There’s little doubt about Saudi crown prince Mohammad bin Salman’s dirty hands all over Jamal Khashoggi’s elimination. Turkey claims to have key incriminating evidence, proving kingdom culpability, indicating high level responsibility. In The Prince, Machiavelli explained how rulers should distance themselves from state-sponsored criminality – shift blame onto convenient patsies. The Saudis are likely to follow this principle. Its Istanbul consul general Mohammed al-Otaibi was recalled to the kingdom and sacked – step one in shifting blame. Clearly no one at his level would order the disappearance and killing of a former Saudi insider/turned critic on his own, notably a US resident in a foreign country. Reportedly Otaibi is under investigation for the Khashoggi incident. He and perhaps others dispatched from the kingdom to Istanbul will likely be blamed for what happened, an attempt to shield the crown prince (MBS) from culpability. According to the Turkish Yeni Safak broadsheet, Khashoggi was killed in minutes after entering the consulate, his fingers severed. Beheading and dismemberment followed, according to a cited audio recording. Reportedly the consulate and consul general’s residence were bugged, enabling Turkish intelligence to monitor what went on inside. Asked about the incident when in Turkey, Mike Pompeo said “I don’t have anything to say about that.” His spokeswoman Heather Nauert said he hadn’t heard the alleged audio. Ankara hasn’t released it or video evidence of Khashoggi’s slaying it claims to have. Washington and perhaps EU governments have their own. Riyadh failed to comment publicly on the incident – other than king Salman and MBS telling Trump they have no knowledge about what happened – what’s clearly untrue. The Trump regime is providing cover for the Saudis, intending to keep US relations with the kingdom unchanged. According to Middle East analyst Simon Henderson, “(t)he US is organizing a diplomatic clean-up operation for MBS and (his) regime,” clearly what’s going on. 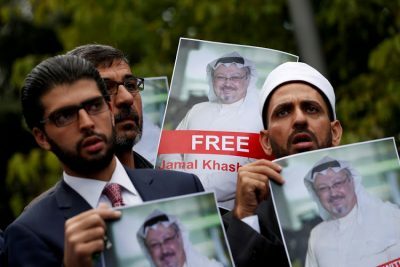 In his last Washington Post column, Khashoggi said Middle East regimes “continue silencing the media at an increasing rate” – failing to explain Western print, electronic and social media self-censor, the way all totalitarian regimes operate worldwide. On Wednesday, Turkish forensic investigators finished examining the Istanbul consulate and official residence of its consul general. According to the Turkish prosecutor’s office, samples were recovered with no further elaboration. It’s unknown if Khashoggi’s DNA or blood traces were found. Unnamed sources said evidence discovered indicated what happened to him. The forensic search included the consulate’s garage and garden, investigators seen leaving the premises with boxes and bags, their contents unrevealed. The notion of Saudi self-investigation about what happened is all about wanting blame shifted from king Salman, MBS, and other key officials to lower-level ones. There’s little doubt about kingdom responsibility for Khashoggi’s fate at the highest level. There’s no doubt about Western/Saudi relations remaining unchanged once the current furor fades. “Possibly they want to implement a plot like the Lockerby case and say that three (Saudis) abducted Khashoggi, and then put them on trial to exonerate” king Salman and MBS. What’s coming by the kingdom will likely be something like the above scenario. Whether it’s enough for MBS to remain crown prince remains to be seen. His involvement in what happened clearly showed he’s inept, failing to consider the potential consequences of his action. Featured image is from BusinessLIVE.